The injector is the main way to put water into a boiler quickly. As an added benefit it also heats the water making it unnecessary to pass the water through the feed water heater. At first glance it seems that it should not work since the pressure coming out of the boiler is the same pressure the injector must overcome to put water back in. Since the injector in the photo is black and so is the background I know it is hard to see. I will try to explain how it works. 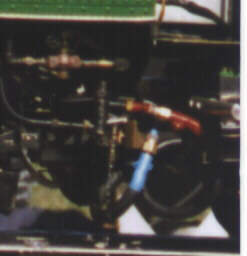 When a valve in the tender is turned water flows into the injector from the red hose, if you look closely a stream of water can be seen dripping out the bottom of the injector out the over flow pipe. Inside the injector the inlet water surrounds a steam pipe controlled from the cab. With steam off the water runs out the over flow pipe. When the steam is turned on it passes through the water, heating the water as the steam condenses, also since the steam is moving very rapidly it accelerates the water surrounding the steam pipe transferring its momentum to the water. The now fast moving water jumps across the over flow hole and into a pipe on the left that leads through a check valve and into the boiler, since water has more mass than steam and is now moving at a good clip its momentum carries it past the check valve and into the boiler. Injectors work very well, but if they get too hot the water is changed to steam and blows out of the over flow pipe. Turning off the steam line allows the water to cool the injector down to the point that it can be restarted. I am sure the engineer who first thought this up was laughed at until he proved it works.